Grant Langston has a front row seat to all the action this summer and we’ll get his thoughts as the outdoors are winding down and ready to crown two new champions. Ryan Sipes can truly can anything on a dirt bike, including showing up and winning a TT race! We’re very proud to have Ryan representing DMXS at the Red Bull Straight Rhythm’s Media Challenge and will discuss of that and more tonight. We’ve known Jason Weigandt for almost twenty years but didn’t know the extent of his uselessness around the house with DIY projects until Kevin came across this nugget of info at Loretta Lynn’s last week. Jason will try to explain how he’s gotten so far in life without these critical manly skills. Wes Williams is living back in Georgia and we are stoked to have him hang with us in the studio whenever he’s not traveling. It was so cool to see Wes back filming at Loretta’s and brought back some great memories to the DMXS/VURB days when the world was truly the best. 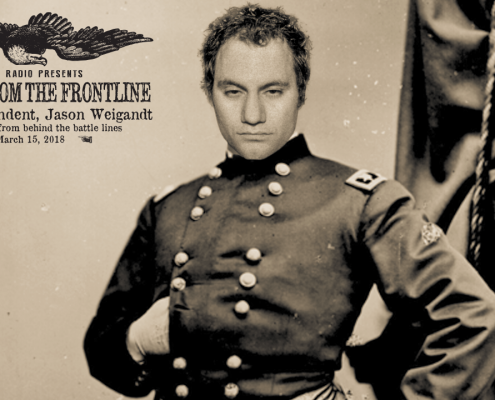 Letters to home by, War Correspondent, Jason Weigandt His accounts from behind the battle lines. We caught up with Racer X’s Jason Weigandt to talk everything from Motocross des Nations to the National Anthem, Stewart, Reed, and more! Give it a listen! Red Bull KTM’s Marvin Musquin is valiantly soldering on this summer and just knocked out back-to-back overall wins after injuring his knee earlier in the season. We’ll get his thoughts on the season and having to pass on the MXdN to get that knee fixed and more. Monster Energy Pro Circuit’s Joey Savatgy went into the break with consecutive overall wins and carries that impressive momentum into Unadilla this weekend. It’s great to see Joey back on the podium and it’s also about damn time we got him back on the show. Autotrader/Monster Energy/JGR Suzuki’s Justin Barcia has been part of our family since he was on mini bikes ripping around the country at amateur races. We always enjoy catching up with Bam Bam and look forward to hearing from him tonight. Racer X’s Jason Weigandt survived Loretta Lynn’s again and lived to tell the stories tonight. The ranch stuff always delivers. DMXS Radio thanks Coach Robb Beams, MyLucasOil.com, Moto Dynasty, SCOTT, Shades of Gray, Racer X, MX Sports, DUBYA Wheels, GoPro, OGIO, Concept2 Rowers for their continued support. His accounts from behind the battle lines.